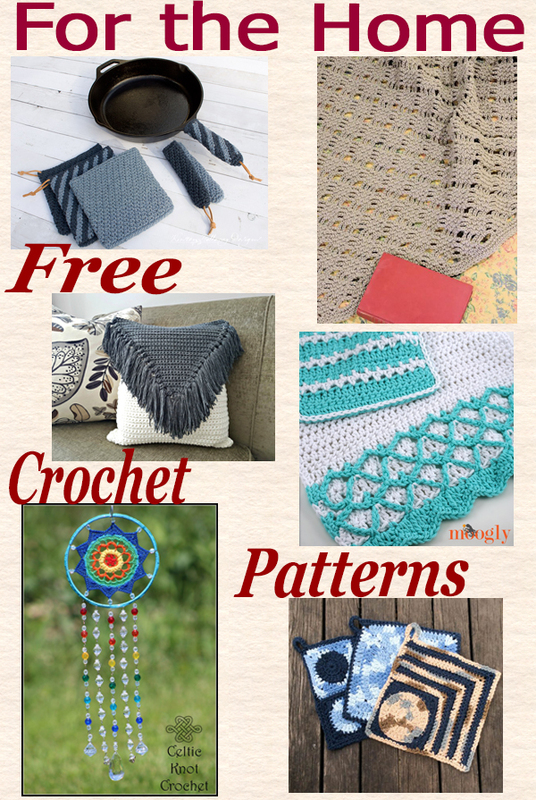 Home Decor Crochet Roundup – A selection of 6 awesome free home decor patterns that you can put your own style and colors too. Get creative and choose from potholders to towels, hope you enjoy. 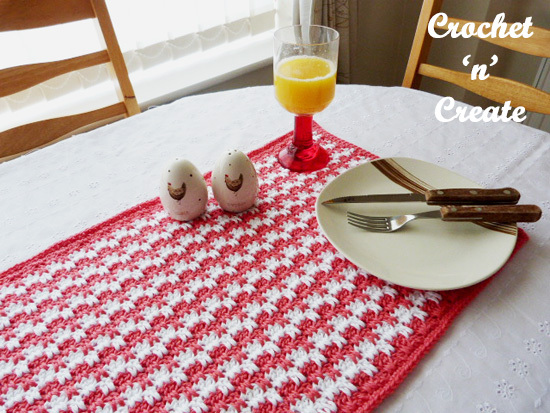 This entry was posted in crochet for the home, Home, Round Ups and tagged crochet, crochet for home, crochet roundup, free crochet patterns on 26th February 2019 by crochetncreate. 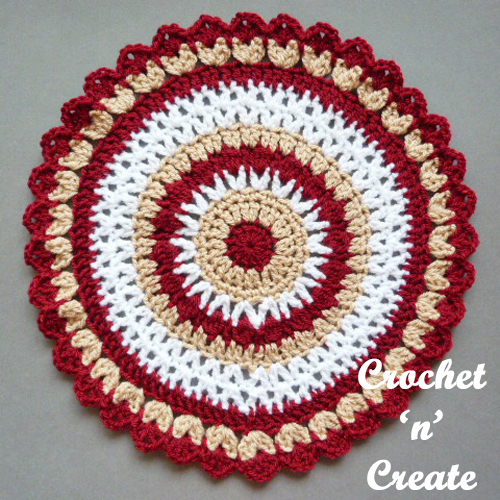 An easy 3 color crochet coaster, ideal if you are just mastering the art of crochet or if you are experienced and want a quick project. It’s made in rows of the same stitch pattern and then I have edged it with a sc stitch. 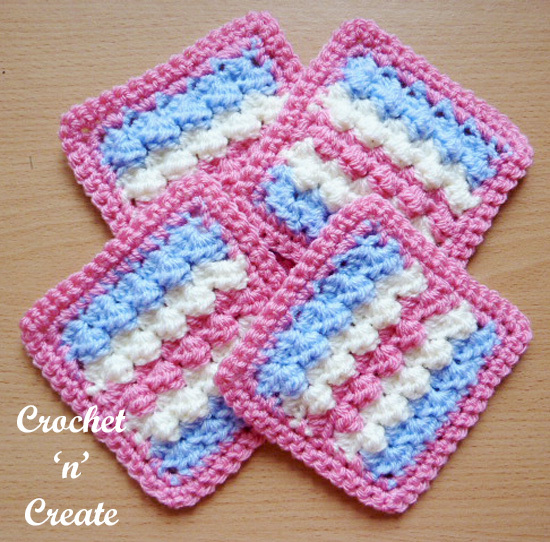 Crochet a few and make a set, I have used 3 colors but you can make in just 1 if you prefer. 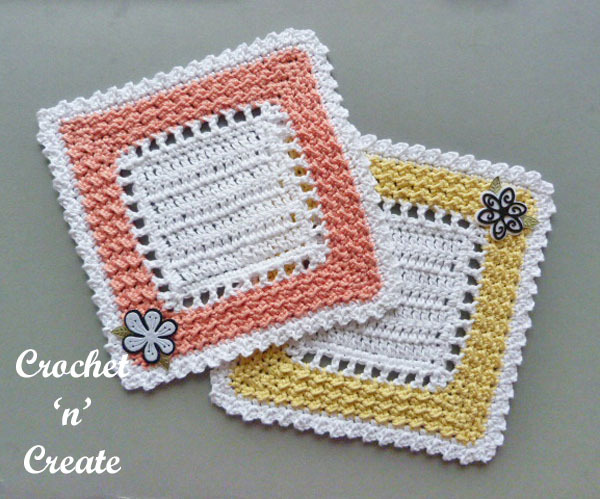 This entry was posted in free crochet patterns, Home and tagged crochet, crochet coaster, crochet for home, free crochet patterns on 3rd August 2017 by crochetncreate. This beautiful round table mat is quick and easy to make and will look gorgeous on your dining table as a center piece or on your side and coffee table in your lounge, just add a plant, vase of flowers or bowl of fruit for the finishing touch. This entry was posted in free crochet patterns, Home and tagged crochet, crochet doily, crochet for home, free crochet patterns on 20th July 2017 by crochetncreate. Doilies never go out of fashion and are always popular, this square doily can add style to any room in your home, make it up in colors to compliment your decor. It will crochet up in just a few hours. 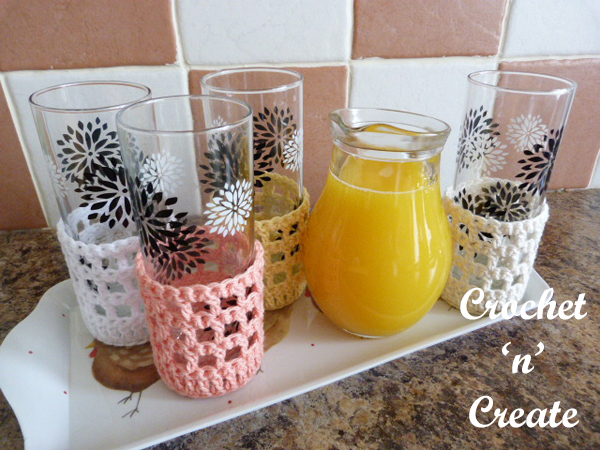 This entry was posted in free crochet patterns, Home and tagged crochet, crochet doily, crochet for home, free crochet patterns on 13th July 2017 by crochetncreate. My free top hat toilet roll cover crochet pattern will brighten up your bathroom, these covers never seem to go out fashion and can always be found on show at fairs and fetes, I remember my Mum and Auntie making lots throughout the year for the local Christmas bazaar. 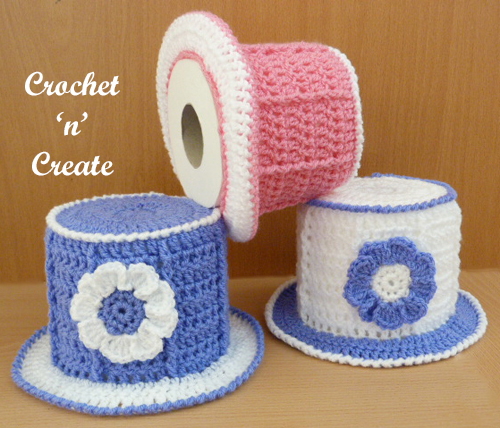 This entry was posted in free crochet patterns, Home and tagged crochet, crochet for home, crochet toilet roll cover, free crochet patterns on 27th June 2017 by crochetncreate. This tumbler jacket is an ideal accompaniment to your tumbler glasses, protect your hands from cold drinks, make a set in different colors to personalize individual family members own tumblers, you can also make a set and give as a gift to friends or to sell. 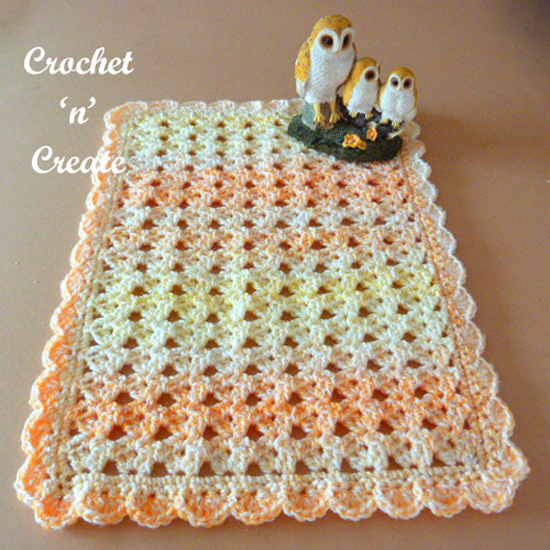 This entry was posted in free crochet patterns, Home, Miscellaneous Crochet and tagged crochet, crochet cozy, crochet for home, free crochet patterns on 25th June 2017 by crochetncreate. This large throw pillow cover can be made to be put on your bed, floor, large chair or just to cuddle up to. I have made the sample in cream colored yarn with wooden buttons, but a more vibrant color and contrast buttons would look good too. It’s an easy stitch pattern so even if you are a beginner crocheter you can give it a go, (impress your friends). Hope you enjoy! 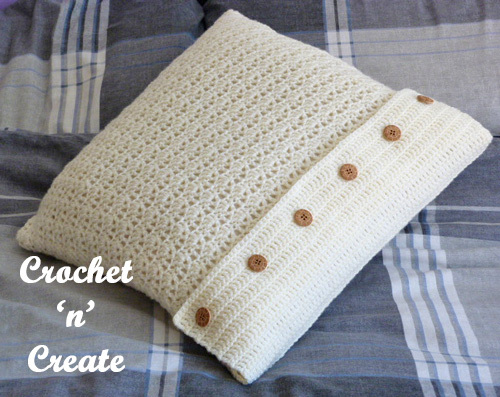 This entry was posted in free crochet patterns, Home and tagged crochet, crochet for home, crochet pillow, free crochet patterns on 20th June 2017 by crochetncreate. A colorful mandala for you to make, mandala’s have been around for a long time and as their popularity grows there are more and more keep appearing on various crochet sites, improve your basic skills and learn how to work in the round. Use them for decoration in any room of your home, as a table center piece, doily, place mat or to hang on your walls. this one is made in three pretty colors, with worsted weight #3 yarn and is very quick to crochet. 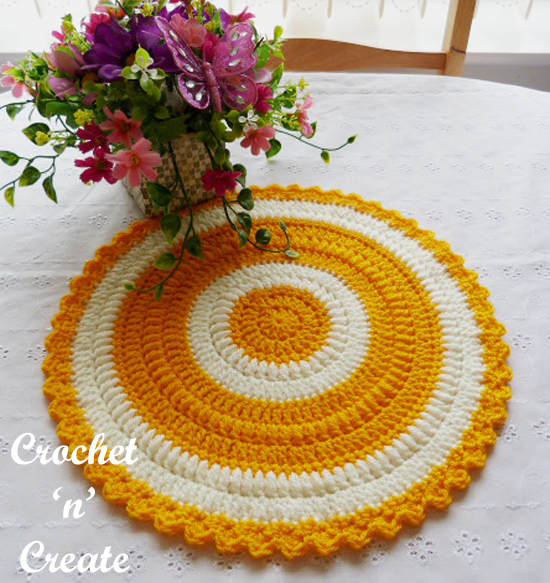 This entry was posted in free crochet patterns, Home and tagged crochet, crochet doily, crochet mandala, free crochet patterns on 16th May 2017 by crochetncreate. This table center mat is suitable for dining table’s, coffee table’s etc, I have made it in a pretty all over shell stitch using a variegated yarn. Use bright vibrant colors for those sunny days and warm mellow ones for colder days, you could change the yarn color to match the seasons or the decor of your rooms. This beautiful mat will look delightful on any of your tables. This entry was posted in free crochet patterns, Home and tagged crochet, crochet for home, crochet mat, free crochet patterns on 9th May 2017 by crochetncreate.